When Kryssi contacted me last summer, I was shocked to say the least! I'm pretty sure more than a few omg's were said:) It's been a long wait to share this news! To celebrate, I'm sharing this card I did up with the Trifecta and Good Times sets! Plus, each design team member is doing a giveaway of a $20 gift certificate on her blog. How can you win one of these? You can enter by doing one or more of the following-do all four to get 4 entries! 2) Like/share Mama Elephant on Facebook https://www.facebook.com/mamaelephant. Leave a comment letting us know. 3) Tweet about us. Leave a comment letting us know. 4) Blog about Mama Elephant, leave a comment with a link. Big thanks to Kryssi and Angela! I'm beyond excited to be a part of this wonderful group and I'm looking forward to sharing this adventure with you! It's gonna be fun! Congrats! Its a very cute card! Such a fun fun card. congrats, JJ! Love the trifecta background! I just love the new stamps! Congrats on the DT! Congrats!..your work is truly amazing! Seriously, how could you be shocked? Of course they want you on their team!! Congrats JJ! Again, what a super-cool card - that background and set of colors are just fantastic. I've been looking for a good t-shirt die, will need to check that one out. Congratulations, JJ! You rock their stamps already! Love this card! Big congrats, JJ! So happy for you! 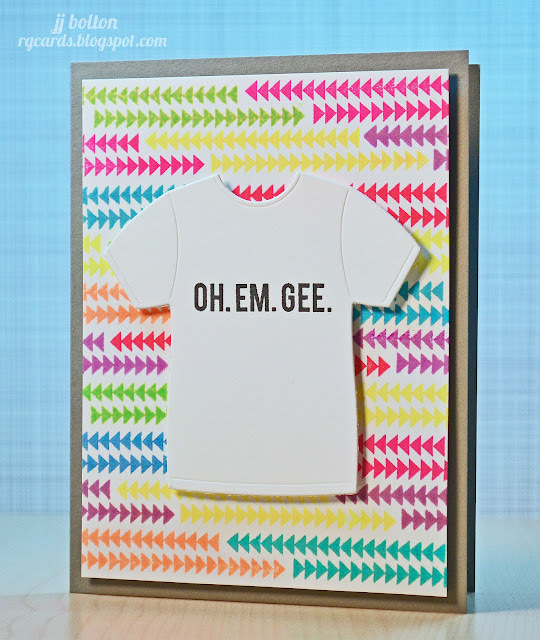 What a fun card and fabulous DT! Congratulations JJ!! Your card is fabulous! Loving the colours! Woohoo! Congrats, JJ ! You are going to be an excellent addition to the new DT! Can't wait to see what you do with the new ME stamps! Yippie for you. Smart lady to get you on her team! Adorable card, BTW. Congratulations! I look forward to seeing what you can do with these cute stamps. Very cute card. I like your colorful arrows and that sentiment. Congratulations too. CONGRATS JJ! They are VERY LUCKY to have you on their team! Can't wait to see the FUN cards you'll be making with their great stamps. these stamps are so FUN!!! Love this card and congrats on making the DT! I like Mama Elephant on FB! Congratulations on your new DT! Can't wait to see what you create with these super adorable stamps!! Love this adorable card too! The brightly colored background is so fun! Great card, love all the fun colors. Congrats on the Design Team! Thanks for the chance to win. Also, I "like" Mama Elephant on Facebook. JJ, I am soo happy for you and I think this company and style is just YOU! Huge congrats and you know I'm already a big fan of yours! I adore this card and in fact I want a shirt like that! LOL Have a great day! I already "like" Mama Elephant on FB! Yes oh em gee indeed! Can't wait to see what you make! gorgeous neon card. congrats being on such a fab DT. Such a fun and colourful card and congrats on being on the DT! Congratulations, and I love your first card. Congrats on the DT, JJ! Congratulaions! I love this fabulous neon-y card =) TFS! Congratulations, JJ! So very happy for you, but not surprised. Beautiful first card! Congrats to you! Cute card! Congrats, JJ! Love your card! I like ME on FB, too! congrats, JJ! what a perfect fit! can't wait to see more of your work with Mama Elephant! Great card! I love the bright colors! Congrats dearie!!! You soooooo deserve this honor!!! Love your super cute card too!! Hi JJ! 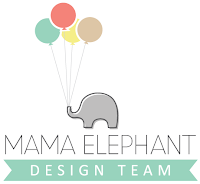 Congrats on being a part of the Mama Elephant Design Team. You must be so excited and it must have been so difficult to keep this news to yourself. Looking forward to the fun! Congrats for your space on the DT! I love that T-shirt on your card...how fun! Ha! Your card made me giggle! Love that sentiment! Congrats!! Congrats and what a fun card--I like the colorful background. Congratulations!!! I absolutely love this sentiment stamp set and I am soooo going to need it in my collection! Can't wait to see what else you'll be making! I am a fan on fb too! woo hoo! oh.em.gee....I love your card and you are a perfect fit for the Mama Elephant DT! Congrats!!!!! This is so fun, JJ! Congrats on the DT! I like them on Facebook and shared. OHHH! I loooooooooove those colors and I LOVE LOVE LOVE the design with the arrows!! FUN! So happy to be joining the ME team with you!!! Such a fabulous card! Love the bright colors! Congrats! I am not surprised JJ~you are incredibly talented! This card is so cool! OMG! I am so thrilled. I adore you and your work! and that trifecta stamp is the bomb! Congratulations ! you already know I think you're awesome!!! I also am smitten by mama elephant! I also like mama elephant on Facebook! Congrats on the new DT gig - I'm sure Mama Elephant will be a big hit! Great card. Congrats on being chosen for the design team! But wait, there's more: I blogged about mama elephant too. What fun stamps and what a great card you created. Sweet! Love those colourful arrows in the background? Big congrats on your DT post - you are going to rock these stamps for.Kryssi! absolutely LOVE the background!! this is fabulous, JJ!! Eeek!!!! Go JJ!! Go JJ!!! YEAHHHHHHH!!!! Big Congrats girl! I know you are gonna knock them out of the park! SO happy for you and can't wait to see all the fabulous things you'll do! !